The Philippines has improved its position in the 2017 World Talent Ranking report released by leading global business school International Institute for Management Development or IMD recently. It ranked 45th out of 63 countries surveyed. It is a big jump from No. 51 out of the 61 nations rated in 2016. This is the country’s’ strongest performance after dipping to No. 57 in 2015. This is not surprising for people who are followers of Bongbong Marcos’ speeches. 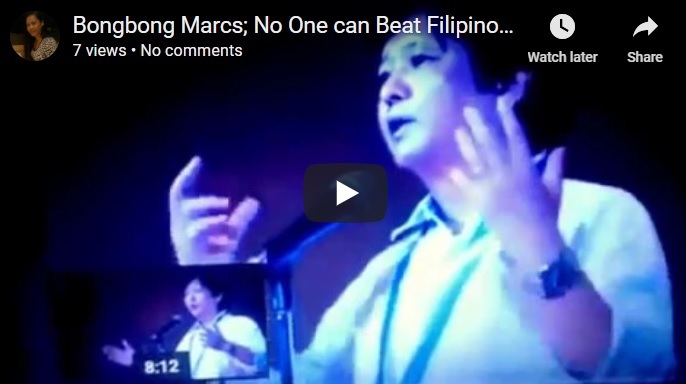 Marcos had said it many times that no one can beat Filipino talents. The only problem is for the government to provide them with the world-class educational system, business infrastructure, and better opportunities locally. [VIDEO]: Despite low investments in education, the Philippines has improved its position in the 2017 World Talent Ranking report released by leading global business school International Institute for Management Development (IMD). Bongbong Marcos is indeed right as he stresses during the CEU Q and A Forum. The Philippines placed 60th in terms of public expenditure on education. The government spending is only 2.7 percent of its GDP for the sector. The country also scored low in the area of the pupil-teacher ratio in primary education and pupil-teacher ratio in secondary education. It ranks 62nd and 59th consecutively. It placed 51st in terms of female participation in the labor force. The best brains or professionals of the country benefit foreign countries that recruit them. The Overseas Filipino Workers have been one of the greatest pillars of the economy through their remittances to the family members left behind. So, it can happen that the best engineers, doctors, nurses and other experts leave the country for the greener pasture. Bongbong Marcos is proud to say that in terms of capability, resourcefulness, ingenuity, and industriousness he has not seen anyone better than a Filipino. Marcos is a well-traveled politician given his family’s history. A Filipino can always survive with flying colors. So, to keep them in the country, better career opportunities with quality health care benefits must be in store for them. That is a priority of his leadership. Next post: Bongbong Marcos: Why Does Robredo Demands Ballot Soft Copies WITHOUT Paying Liability?